Red Spot has been reintroduced to Irish Distillers’ range of single pot still Irish whiskeys following a 50-year absence. Originally produced in the early 20th century, Red Spot formed part of Dublin wine merchant Mitchell & Son’s Spot Whiskeys range, which also included Green, Yellow and Blue variants. However it was discontinued in the mid-1960s. Based on an ‘old recipe’ handed down by Mitchell & Son, the new Red Spot is a triple distilled single pot still Irish whiskey from Midleton distillery, matured for at least 15 years in a combination of ex-Bourbon, oloroso Sherry and marsala casks. 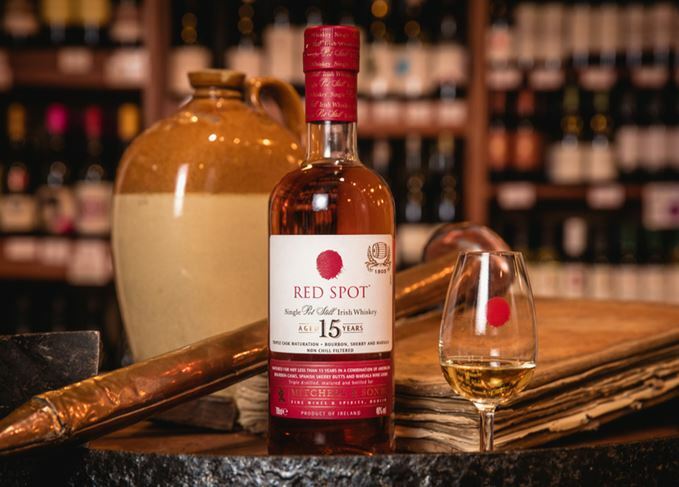 Red Spot has been bottled at 46% abv without chill filtration, and is now available for around €115 in Ireland ahead of its release in the US, UK, France and global travel retail in January 2019. The expression joins Green Spot, which was discontinued in the 1960s and reintroduced in the early 2000s, and Yellow Spot, which was reintroduced in 2012. Kevin O’Gorman, master of maturation at Midleton distillery, said: ‘It has been 50 years since the world last saw Red Spot and whiskey enthusiasts have long awaited its return – this is a bold whiskey that packs a punch, has incredibly rich flavours and an extra-long infusion of fruits and spices on the finish that provides a truly unique and colourful ending. The Mitchell family set up as a wine and confectionery merchant on Dublin’s Grafton Street in 1805. They later expanded into whiskey bonding in 1887, sending empty wine casks to the nearby Jameson distillery on Bow Street to be filled with new spirit for maturation in its own cellars. The Spot Whiskey range was first introduced during the early 1900s, taking its name from the daub of coloured paint used to mark maturing casks to determine the potential age of the whiskey – a blue mark indicated seven years, green 10, yellow 12 and a red spot 15 years. Brendan Buckley, innovation and prestige whiskeys director at Irish Distillers, said: ‘The release of Red Spot marks the next colourful chapter in the story of the Spot Whiskeys range, which is becoming increasingly popular among modern whiskey drinkers across Europe and the USA due to its focus on innovation, unique role in Dublin’s whiskey bonding history and world-renowned high quality. Irish Distillers, which produces the Spot Whiskeys range in partnership with Mitchell & Son, has not hinted at when the final Blue Spot variant will return to shelves. The young Dublin distillery’s first release is a three-year-old single pot still whiskey. Is Irish pot still the new single malt? As the Irish whiskey boom continues, will pot still ever challenge single malt Scotch? The new distillery’s traditional methods include direct firing and worm tub condensers.